Did you know that WordPress is responsible for roughly one-sixth of the world’s websites and that 20% of all new websites run on WordPress? That’s impressive. Our MyMac.com website runs on WordPress. If you are a brand new blogger or an experienced web developer, WordPress: The Missing Manual is for you. O’Reilly’s Missing Manual series of tech books is huge, uncompromisingly accurate, and the authors are experts on their topics. This book’s author, Matthew MacDonald, is a website development professional and author with more than a dozen books to his credit. In WordPress: The Missing Manual he tackles a sometimes-complex subject with an approachable style that explains concepts in ways that are easy-to-grasp. Typically, someone new to website creation starts with a simple blog. WordPress handles that easily. Eventually, there is a need for an actual website and, again, WordPress is capable. This book covers all of this from the simplest sites to creating ways for readers to comment with posts of their own. Adding e-commerce capabilities, making a catalog, adding photo or video content, and customization of many other types is carefully covered. Much of this content is similar to what is offered in professional education such as a devry university information systems degree programs. WordPress is like an open-source gateway drug. You start small and as you expand your site you begin to flex your development muscles by adding more features. Most people are perfectly content to stay at this point forever while others may want to go further into self-hosting a WordPress site. Taking this step gives you access to thousands of plug-ins and themes but can become geekily complex. Matthew MacDonald’s WordPress: The Missing Manual starts off in first gear by conscientiously explaining the basics and gradually increasing your power and speed as you begin to grasp WordPress. Toward the end, you’ll be in overdrive but if you’ve been paying attention, you’ll discover that you now actually understand much of this stuff. Getting into the nitty-gritty of developing a website is not for the faint-of-heart. It can be frustrating. 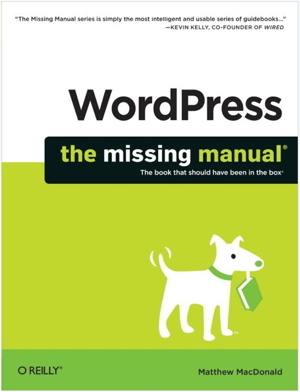 WordPress: The Missing Manual will help you through many of the pitfalls, but it isn’t a panacea. You’ll need determination and patience. If you have difficulties, consulting the WordPress sites directly (www.wordpress.com and www.wordpress.org) may provide additional assistance.